Moving into December it was now time to get the faster stuff done to prepare for the race pace workouts in Jan and Feb. This is also where I decided we had to break one of the cardinal sins of training. All the experts say to train at your current condition and not at your goal pace. Well, I knew if we trained based on the current 4:00:00 range that we would have no shot at a BQ by March so I planned on running at the paces needed for the 3:40. I found out pretty quickly that even holding Amy back to that pace was going to be nearly impossible. One of the great things that has worked for us is that I am able to run all of the key workouts with her as well as the occasional easy and recovery runs so I know her very well. I am always monitoring her breathing and effort as we run along and because of our friendship I can keep up with her other activities and plan around them. Some days when I can sense she's struggling, I'll change the workout mid-run and other days when she has had some hard yoga or circuit I'll just re-schedule a hard run. But then some days she unexpectedly is feeling good and pushing the pace so I'll just hang on and go with it and then other days I just let her go. For example one day I had planned 800's at 3:40 which should have been about our lactate threshold pace but Amy took off on me. I just went along and the first one was 3:28. It felt good so we just kept it up. She dropped back on the last two but I didn't back off since she had set the tone for the workout. I could tell from that one that the training was going very well and was gaining more confidence. Then on Christmas Eve we met and I was hoping to do some mile repeats at tempo pace , about 7:30's. Once again she felt good and took off on me crushing the first mile in 7:10. It felt good so I just went with the flow but this time she held strong and killed the last one in 6:52 while I struggled 3 seconds behind her. A week later it was time for more 800's. I had decided we would do the same pace as the last time and go for about 3:30 average. Well, she took off like there was a fire and I just let her go and didn't even try to stay with her. She ran a crazy 3:18 while I nailed the 3:30. As expected she paid for it. The next couple were right on pace but by the 4th one she was struggling to recover and by the last two she was finishing about 8-10 seconds behind me. Of course when I had added those two extra repeats, which really I didn't because I had planned them from the beginning, but for some reason Amy thought we were doing 4 instead of 6, she got to call me her favorite nickname giving me the chance to sing the song to her again while I laughed !! You have to love her spirit and exuberance ! The good thing that came from that workout was that from that point on she did a much better job of sticking with the planned pace on most of the workouts but it didn't stop her from pushing me on some of the other days when I was expecting an easier pace. And I'm really happy for that because I enjoy being pushed myself and it showed me that the overall plan was working if she could recover and feel good on those days. I had my 50 mile race a week and a half later and shattered my pr by over an hour ! Proved to myself again that I run my best ultras off a strong marathon training plan . I was even amazed at how quickly I recovered and another week and a half later Amy and I started working on the hard marathon and half marathon pace workouts. I must say that these went even better than expected for both of us. We did a very good job of running the paces within a few seconds per mile and the one workout that stands out was a 3x3 mile mp run that went so well that Amy beat her half marathon pr by 10 minutes with the warm up and recoveries included. That was a huge confidence boost and another sign the training was on track. 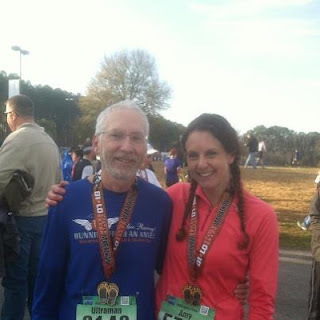 The next few weeks went very well and then it was time for the test at the Myrtle Beach Half Marathon. What a perfect run ! It went exactly as I hoped with perfect pacing and a stronger than hoped for finish. When we first started this we were able to get together 2 and sometimes 3 times a week to run together but over the last couple of months we have been able to meet 4 and some weeks 5 times. Getting in all the extra miles and quality workouts has really shown what she can be capable of doing and now with the race coming up this weekend. I feel very confident that she will get that Boston qualifier. But this is only the beginning. She has so much potential to run pr's at every distance for years to come and I know one thing for sure. She will give it everything she's got ! I just hope I can continue to hang with her for at least awhile longer !